A NECESSITY OR A NEEDLESS BOTHER? Many women are confused by toners. Are they really necessary? If you are rinsing your face after cleansing anyway, why use a toner? Toners serve several purposes. First, they remove any traces of cleanser that simple rinsing might have missed. Secondly, when you cleanse (regardless of what cleansing or soap product you use) you disrupt the normal ph balance of your skin. Our skin is a living organ and recognizes the ph balance is off, and then goes into "overdrive" or stress mode to get the ph balance restored. 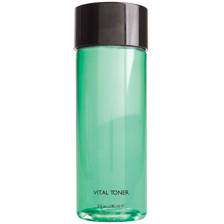 Using a toner immediately restores the ph balance, which leaves the skin calm and de-stressed. Cleansing also opens the pores of our skin and using a toner closes and tightens the pores. Thirdly, you may notice after wiping your face with toner on a cotton pad, the pad is stained, possibly with perspiration, old makeup etc. If you had not used the toner, that residue would have remained on your face under your makeup. Yuk! The best toners have no alcohol in them and are paba and fragrance free. Wet a cotton pad with toner and gently wipe your face immediately after cleansing. You will love the fresh, clean feel that a good toner provides. or call me directly to order at 239-454-0044.